Next to the Red Stag, the Axis Deer is generally considered one of the most attractive of all wild deer. Their beautiful coloration is primarily a reddish brown with white under their throat, stomach and tail area. Most Axis Deer also have a dark stripe that runs from their head to their tail and white spots that dot their sides and upper body. Of course, their most impressive asset is their long barrel shaped antlers. It is these extremely tall and narrow antlers that create the mount that most trophy deer hunters can’t resist. Axis Deer are also considered one of the best tasting wild game meats and with adult males tipping the scales at over 200 pounds, you’ll have plenty of table fare for months. The venison is a mild, naturally tender red meat that contains less than 1% fat on average. Native to India and Sri Lanka, the Axis Deer was introduced to the United States decades ago and now is one of the most common deer in southern areas of the country. Axis bucks can be in hard horn any time of the year as they grow and shed antlers on their own clock. 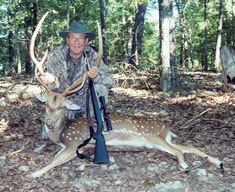 As such, Axis Deer hunts are available at many times during the year. They are very elusive animals and typically provide for a very challenging hunt. Our herd at High Adventure Ranch is great in number and typically includes a number of gold medal record animals. Axis hunts are done by spot and stalk or 4x4 and can be done with rifle, shotgun, hand gun, bow, or black powder. For more information or to book your Axis Deer Hunt, please call (314) 209-9800 or fill out our contact form.